HR Traditional > Brampton Traditional Towel Radiator H1500 x W575 (Chrome). Hudson Reed Brampton traditional towel radiator. High quality and extremely durable. Heat output: BTU @ 60°C: 2736. Size: H1500 x W575 x D235 mm. Radiator valves are not included (sold separately). NOTE: We recommend pipework is not installed until receipt of radiators or heated towel rails. 20 Year guarantee: Hudson Reed guarantee these radiators for 20 years. Imagine a warm towel after showering, it's a must for comfort and relaxation. 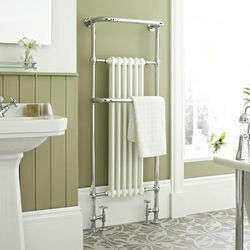 The Hudson Reed Traditional range of heated towel rails offer modern day comfort with a classic, ageless look. The Hudson Reed Series towel rails can be fitted with central heating valves. Radiator valves should be purchased separately. All heated towel rails come complete with fixing screws. After installing any new radiators, when refilling the system it is recommended a suitable inhibitor is used. All tappings are 3/4"BSP.